Living's not too shabby for broker Ryan Serhant. 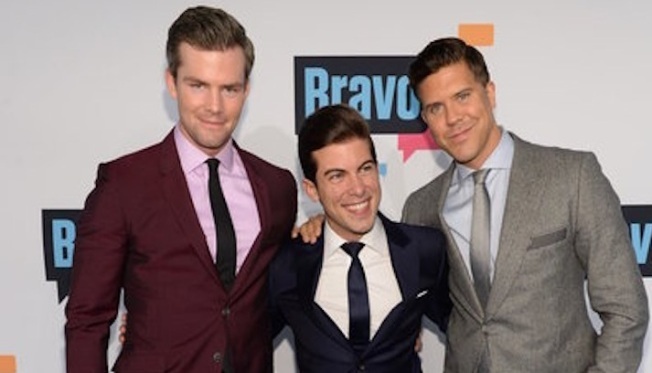 Ryan Serhant of Bravo's "Million Dollar Listing New York," pictured here, left. On Bravo's "Million Dollar Listing New York," we get a look at the life of Ryan Serhant as he finds buyers and sellers for his clients, but have you ever wondered what Serhant's day is really like? Does he go to the gym in the morning? What time does he get to the office? What does he snack on? The New York Observer has those answers and lot more, as it takes a look into the life of Mr. Serhant. During the day, via Escalade, Serhant makes his way through a construction space near the High Line, to a space on East 17th street. His brunch is a Monster energy drink and a protein bar. During lunch, Serhant assists a law student looking to stay in West Chelsea, showing her two properties before heading back to his headquarters in Midtown. The interview ends at 5 PM, when Serhant is on his way to meet an interior designer to discuss a client seeking a three-bedroom in Soho for $8 million. (Seven hours until he will be able to "congratulate himself on another successful day," and get some shut eye in preparation for another busy day four-and-a-half hours later.